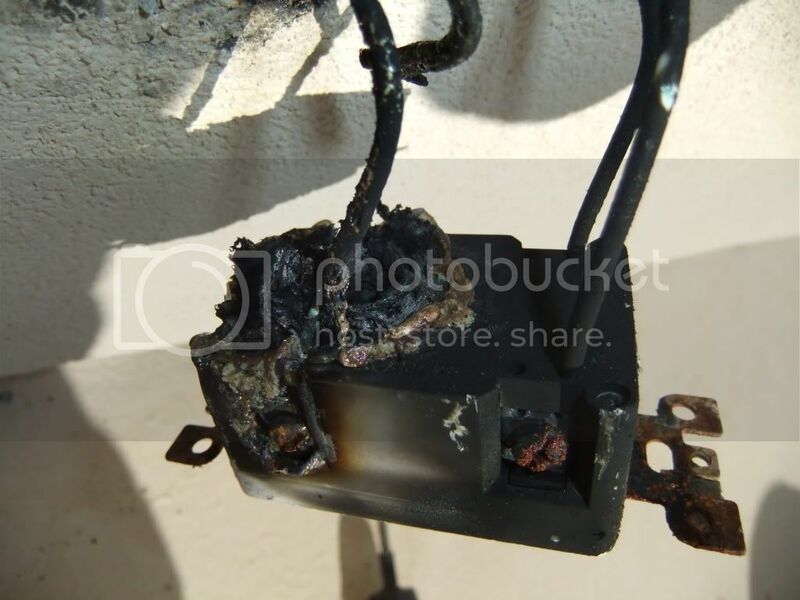 The photos in the link below reveal the catastrophic failure of a 4 year old GFCI receptacle mounted in a parapet wall surrounding the roof deck on a home located one block from the Pacific ocean. Assuming that it failed because of the corrosive marine environment, it could serve as the poster child for the importance of the use of the new weatherproof devices developed for outdoor use. It was part of a 20 amp circuit dedicated to the roof deck. The load terminals fed a single additional receptacle which also showed signs of considerable rust & corrosion on the back strap, mounting screws and connection screws. Neither outlet was being used at the time. 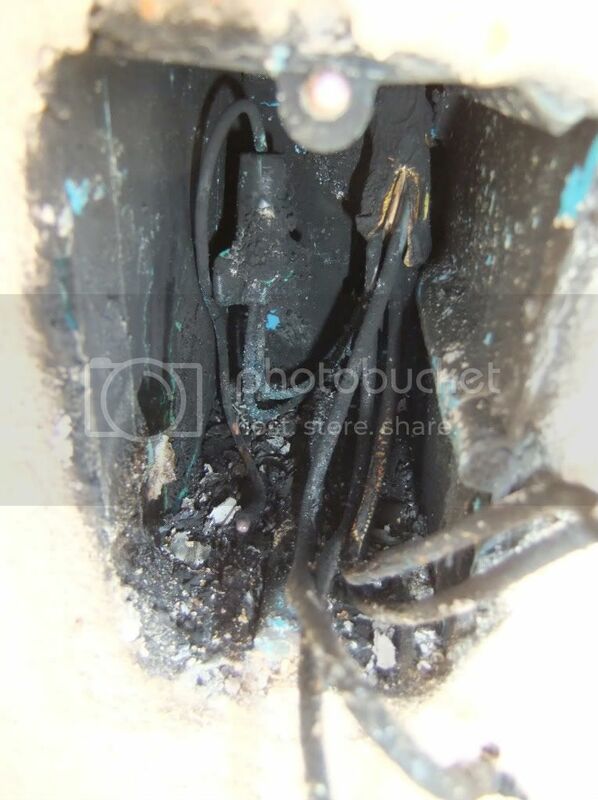 I would be interested in knowing if any of you have seen similar problems with GFCI receptacles that were not simply due to arcing at a loose connection. Thanks, I couldn't figure out how to do that! 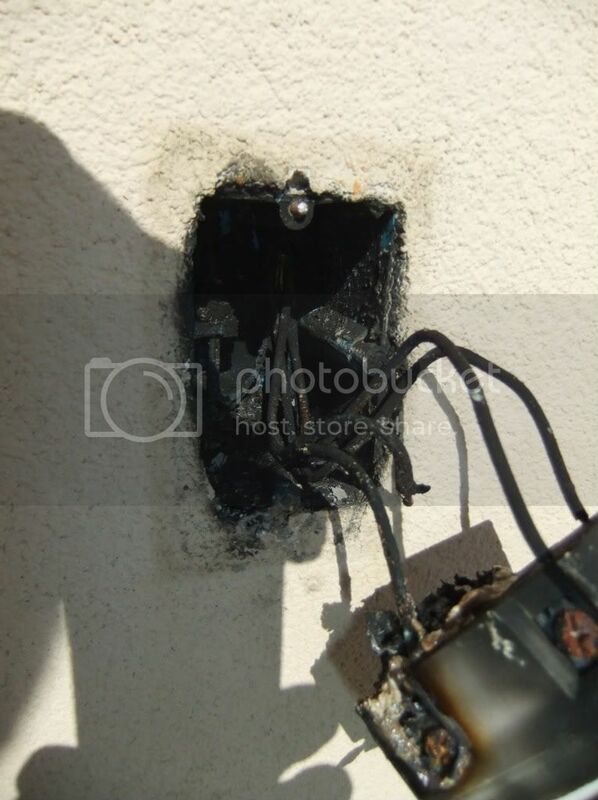 I have had this happen over the years on several O/S GFCI's the worst was ones installed in brick where someone power washed the brick with conductive cleaners. While for the most part the box did it's job and contained the smoke and fire to the box (yes even plastic) but this is not to say it couldn't cause a fire if something more combustible was in the wall such as paper backed insulation. There have been other post on the forum of this happening. The problem is keeping the box sealed from water, most covers come with the thin cardboard gasket that doesn't seal very well on stucco or brick, or much of any thing else, I have always tried to use the thicker foam type gaskets, and make sure the in-use cover gets a good bead of silicone around the top and sides of the cover but not the bottom, I also started coating the wire openings on the GFCI with dielectric grease to keep water out of the back of the GFCI, I havent had one fail like this in a while. The "WR" devices are subjected to some corrosion testing, but nothing like the testing that has been done for decades on the 'corrosion resistant' devices you can find in everyone's catalogs. Another design issue is how we deal with moisture. Often gaskets make things worse, rather than better. This is because water can get in - as vapor, if nothing else - but it can't get out. We're usually better served by providing for the water to drain. Another approach is to incorporate a tiny, electronic heater element that will dry thing off, given some time, and perhaps prevent condensation as well. The NEC tells us to install receptacles, but is silent on what we need to consider when we place them. 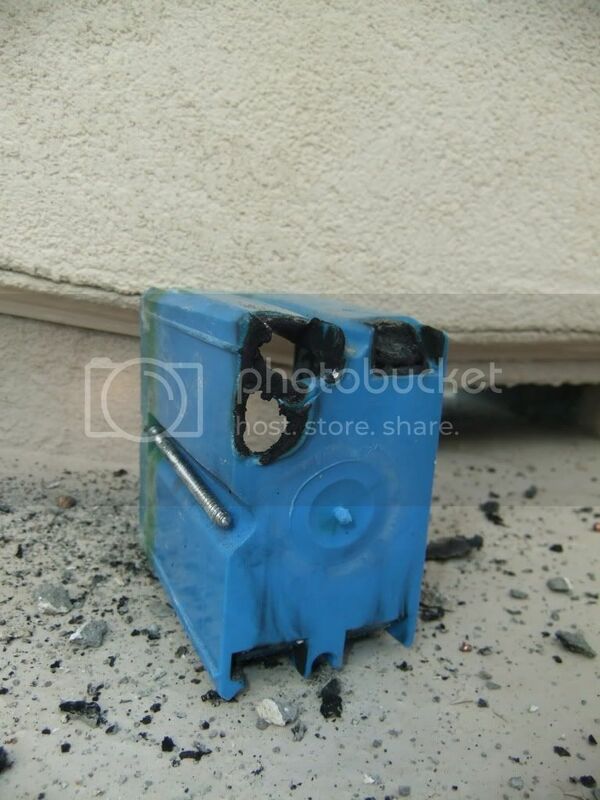 There's nothing to prevent you from placing the receptacles where they are sheltered somewhat by location, orientation, or other building components. The GFCI protection need not be at the device. C-H has a point in their argument that sometimes having the GFCI at the panel is a good plan. After all, there's less to be damaged by corrosion. It's telling that corrosion - according to their study - most often acts in a manner that prevents the GFCI from tripping, but continues to power the device. Finally, nothing lasts forever. It is unreasonable to expect even a $10 device to last more than a few years in a harsh environment. "Bubble" covers will not prevent moist 'salt air' from entering the device. Nor do the pictures tell if there was a cord plugged in at the time, or if the connections were tight. We simply don't know if corrosion was the cause of this failure. This particular building was a two story rectangular stucco & glass box with a flat roof which afforded virtually no protected areas in which to locate the required and / or desired exterior electrical outlets. I agree that it is always wise to look for and take advantage of porches, roof overhangs, etc when locating outdoor outlets. Studies I've read about failures of GFCI devices indicated a far higher failure rate for GFCI circuit breakers than for GFCI receptacles. Leviton has a 2 year warranty on their GFCI receptacles and the device did do its job for four years. I wouldn't have been surprised to find that after four years it had just quit working or that it had tripped and wouldn't reset. What I find very troubling is that it spontaneously melted down in way that could have potentially destroyed a million dollar home. The warranty terms limit liability to replacement of the defective device. I was told that when this event occurred there was nothing plugged into either one of the roof deck receptacles and that they have rarely if ever been used at all. Fires can be a good thing as they keep us working. Would figure out something better for the replacement and perhaps thats a gfi breaker. Salt in air likely had a part in it. 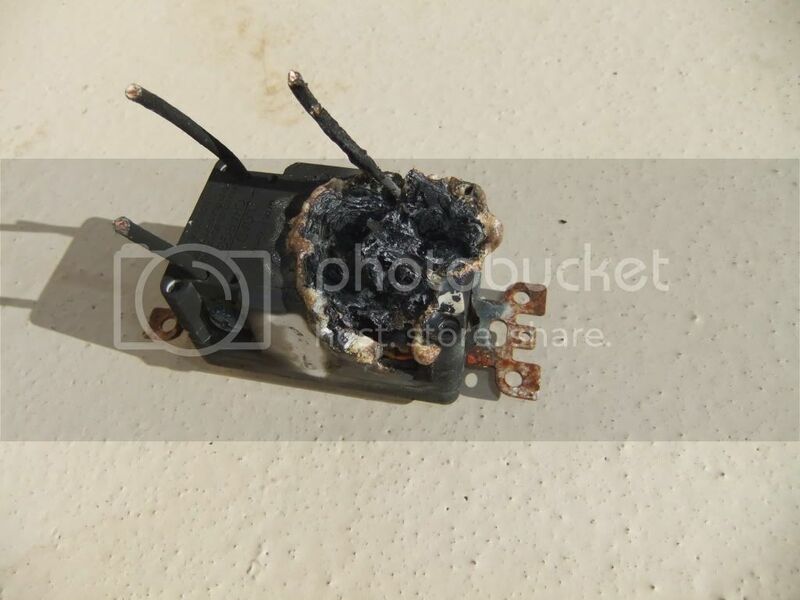 1: Your posts says catastrophic failure of a GFCI, so my first question is: did you still have power at the GFCI? meaning you can plug something in and still have power? 2: Looking at the pictures, I know there's couple holes in the box which could ignite anything beyond them, but at the same time it seems the overload protection didn't do its job. Hate to ask (but I have seen so many times 40-50 amps breakers on #12 wire because, what owner's thought was nuisance tripping, when in fact the breaker was doing its job), but was the breaker sized accordingly? I was not the first to open the box so I can't really say if there was still power to the outlet or not. 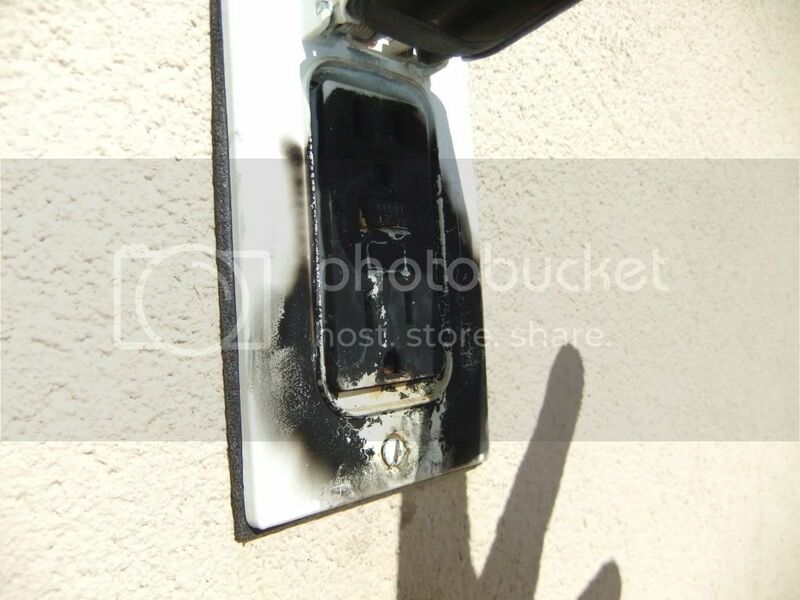 When I first saw this someone else from a home warranty company had already either turned off the breaker and left it off or they might have found that the breaker had tripped and just left it off. I didn't see any reason to turn the breaker on to see what would happen after seeing the condition of the device. I also don't know for sure if that phase conductor broke loose when the device was pulled out for the initial examination or if it melted away from the device during the "event," thus breaking the circuit. I can tell you that the circuit was properly wired with #12 Romex and was protected by a four year old 20 amp single pole GE breaker. There is no reason to conclude that the breaker didn't do what it was supposed to do, even if it never tripped. As long as the arcing electronics didn't consume more that 20 amps of current, it could sizzle & smoke and burn indefinitely. Eventually something in this bubbling mess likely shorted out and allowed enough current to flow to open the breaker or one of the conductors melted and created an open circuit which ended the event without ever tripping the breaker.